Some activity cards to practice 2nd conditional. Cut out the cards and put them in envelopes. Put students in groups or pairs. Give each group/pair an envelope. Students in turn draw out a card and ask the other student/s the question written on the card. Set a time limit and monitor to correct possible mistakes or help with the needed vocabulary. The present downloadable printable is intended for high school students and adults at Pre-intermediate (A2), Intermediate (B1) and Upper-intermediate (B2) level. 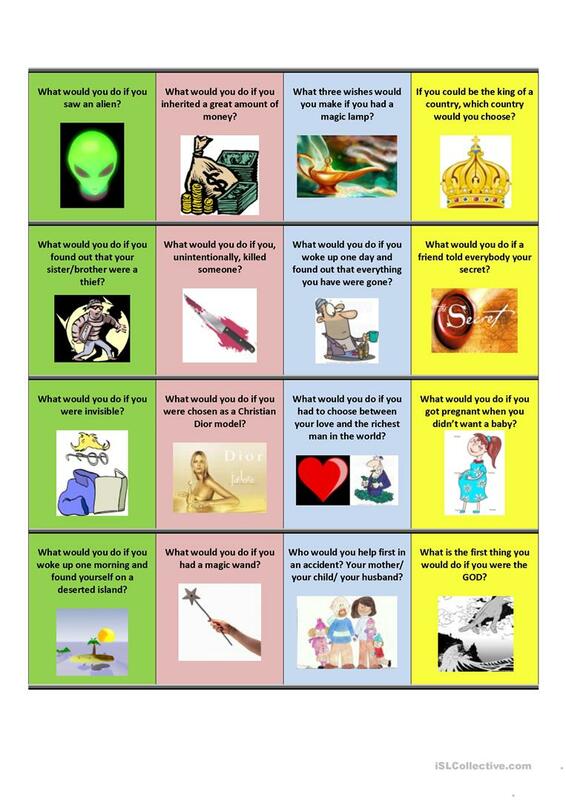 It is a useful material for teaching Conditionals in English, and was designed for developing your groups' Speaking skills. It includes the answer key, too.